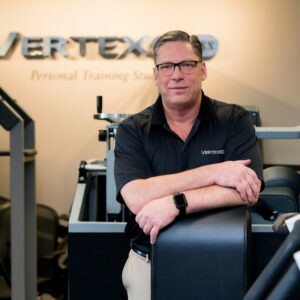 Dwayne Wimmer is the founder and trainer of Vertex Fitness Personal Training Studio located in Bryn Mawr, the heart of Philadelphia’s Main Line. With professionalism, expertise and personal attention as his hallmarks, and the utmost concern for his clients’ fitness and wellness as his vision, Dwayne fulfilled his ultimate dream in 2001 by opening his own personal training studio. His caring, patient yet guiding one-on-one approach encourages individuals to achieve their fitness goals at their own pace, all the while pushing them to their personal limits so they reach top physical condition. Some of the most common questions and requests I get from listeners and clients within the Corporate Warrior Membership is ‘How do I get more clients?” and “How do I sell high intensity strength training?”. Sales and business development is typically a big challenge for any business, but it can be particularly hard in the strength training industry. Especially when you’re competing with a myriad of health and fitness “solutions” that promise “instant” results. This episode is brought to you by VitalExercise.com, a one-of-kind personal training facility in the UK owned and run by world-class personal trainer, Ted Harrison. For over 30 years, Ted has been very successful in helping people achieve great results, and, if you’ve seen the blog posts for his episodes on this podcast, you’ve seen that he walks the walk. For 57, he looks amazing! Operating from a HIT base, Ted uses an eclectic mix of training styles to optimise results for his clients. Ted put me through one of the best workouts of my life and is someone I go to for advice often. To book a free consultation either at his facility in Essex in the UK or to find out more about his virtual coaching, which includes personalised training, nutritional and motivational advice, go here where you can fill in a contact form or phone Ted directly for more info. The comments about how many of his clients just are unwilling to train at the intensity that he and others can achieve was pretty interesting. It reminded me of my experience trying to do Tabata intervals for High Intensity Interval Training. In theory, getting to 170% of your VO2max for brief intervals should lead to very time efficient conditioning workouts. But the pain and discomfort associated with that is so high, that I just can’t bring myself to do that on regular basis. So, for me, it just isn’t a sustainable way to workout. Hey Greg – Yep, as I said, I personally get caught up in a bubble thinking that MMF is mandatory. Many people just can’t train that intensely at the beginning, and as per your point, perhaps there are some protocols that many are not prepared to execute on a regular basis. “As Bertrand Russell said . . . “The fact that an opinion has been widely held is no evidence whatever that it is not utterly absurd.” The truth of which statement can be clearly demonstrated by thousands of examples; but it is also true that flying in the face of popular opinion usually results in a crash rather than a successful flight, particularly when the people you are trying to communicate with are so stupid that they are capable of understanding almost nothing. Or, worse, are not even aware of things that they must clearly understand if anything approaching real communication is even possible. You can sometimes, although rarely, make such people believe something, but you will never make them understand it. When such people consider themselves “expert” in the field being discussed, then you are really treading on thin ice; convincing them that their theories are wrong is almost always impossible, will usually get you nothing for your efforts apart from slings and arrows of outrage. I will not hold my breath for an explanation….pun intended. The reference from Wimmer is NOT a study but rather a comprehensive, systematic narrative review of the literature surrounding the area of resistance training, cardiovascular fitness and the acute responses and chronic adaptations it produces. The authors: Steele J, Fisher J, McGuff D, Bruce-Low S, Smith D…….familiar HIT names. Biased……You decide. I don’t know or care why the confusion over rather simple biochemistry and physiological adaptations to exercise…… but surely Edgar Alan Poe in the “The Hunting of the Slan” said it best.